By Dowsing Co. Ltd. Stores reference 22c/103/104. 'Boots, Flying, Electrically Heated', 24 volt. Size 8. Brown leather ankle boots with front zips, adjustable buckled straps at the top and substantial rigid rubber soles. These boots are fitted with heating elements within the linings and a 2-pin plug connector at the top edge. Although intended for use with the electrically wired thermally insulated Irvin flying suits, the heating elements often proved unreliable resulting in burns for the aircrew. Many had the plugs removed and were worn with several pairs of socks instead. 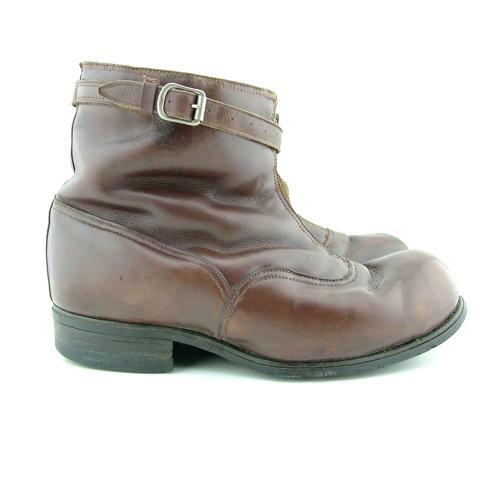 The leather is generally in excellent condition bar minor scuffing and wear. The 'Lightning' zips are in excellent working order and the original soles and heels show moderate use and wear. Excellent straps/buckles. Good linings and both boots retain the wiring elements and plugs though the one in the right boots needs sewing back into place. Each boot is labelled but only that in the left is legible. The right boot also has a fading Air Ministry crown ink stamp externally. A very good '+' pair of these rare boots. Stock code B22823/23008.